Researchers at NESG are using structural genomics to reveal the secrets of signaling within cancer cells. The structure of retinoblastoma binding protein 9 showed that it is a serine protease as well as a partner of retinoblastoma protein. Biological complexity is at its most complex when we look to signaling. Cells use a flurry of kinases, phosphatases, proteases, regulators, and other components to communicate in a vast and interconnected signaling network. It is often difficult to tease out the activity for an individual component, since the entire network evolved in an interconnected manner, and many components play many overlapping roles. That being said, some proteins play leading roles, acting as hubs at the center of important signaling tasks. Researchers at the NESG are trying to make sense of this network by gathering the information that is known about signaling in cancer. In their HCPIN database, they have identified these signaling hubs and their interactions within the larger network, and are now working to solve structures of all of the players. As part of this work, the NESG has identified over a thousand proteins that are important in cancer signaling, but for which no structural information is available. RBBP9 is one of the first wave of proteins studied. It is a binding partner of the retinoblastoma protein, a central player in regulation of the cell cycle, differentiation of cells, and programmed cell death. Retinoblastoma protein was the first oncogene to be discovered, and mutations in the protein are often found in cancer cells, allowing them to evade the normal controls on growth. RBBP9 blocks binding of retinoblastoma protein to one of its major partners in signaling: E2F1. Also, when overexpressed, RBBP9 blocks the normal function of TGF-beta1, which is important in arresting abnormal growth. 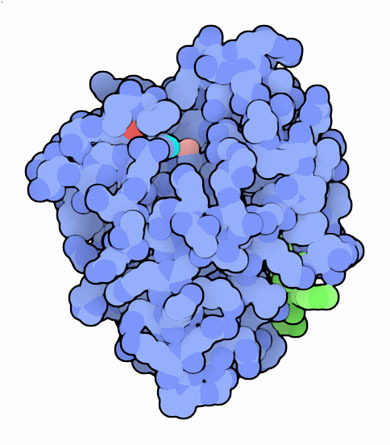 The structure of RBBP9, available in PDB entry 2qs9, answered some questions and posed others. The sequence of the protein was typical of a mixed alpha-helix and beta-sheet structure. The crystallographic structure confirmed this, and located the small LxCxE motif (shown here in green) that is characteristic of proteins that bind to retinoblastoma protein. The structure also revealed a classic serine protease active site, with a serine-histidine-aspartate catalytic triad (shown here in pink, cyan and red), even though the protein had no known enzymatic activity. Recently, biochemical studies with pancreatic cancer cells have confirmed that the protein does act as a serine protease, acting on a yet-unknown target in the TGF-beta1 signaling pathway. Retinoblastoma binding protein 9 is a small enzyme with a typical serine protease catalytic site. The three catalytic residues (serine 75, histidine 165 and aspartate 138) are shown with white carbon atoms here. Use the buttons below to switch to a spacefilling representation to see the active site groove that presumably recognizes the target protein. 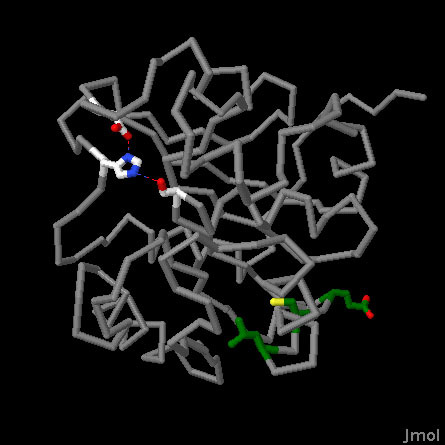 The LxCxE loop, which is important for binding to retinoblastoma protein, is shown with green carbon atoms. Mutation of the leucine (the sidechain with all atoms in green) to a glutamate was shown to abolish binding to retinoblastoma protein. Vorobiev, S. M., Su, M., Seetharaman, J., Huang, Y. J., Chen, C. X., Maglaqui, M., Janjua, H., Proudfoot, M., Yakunin, A., Xiao, R., Acton, T. B., Montelione, G. T. and Tong, L. (2008) Crystal structure of human retinoblastoma binding protein 9. Proteins 74, 526-529. Huang, Y. J., Hang, D., Lu, L. J., Tong, L., Gerstein, M. B., Montelione, G. T. (2008) Targeting the human cancer pathway interaction network by structural genomics. Mol. Cell. Proteomics 7, 2048-2060. Shields, D. J., Niessen, S., Murphy, E. A., Mielgo, A., Desgrosellier, J. S., Lau, S. K. M., Barnes, L. A., Lesperance, J., Bouvet, M., Tarin, D., Cravatt, B. F. and Cheresh, D. A. (2010) RBBP9: a tumor-associate serine hydrolase activity required for pancreatic neoplasia. Proc. Natl. Acad. Sci. USA 107, 2189-2194.